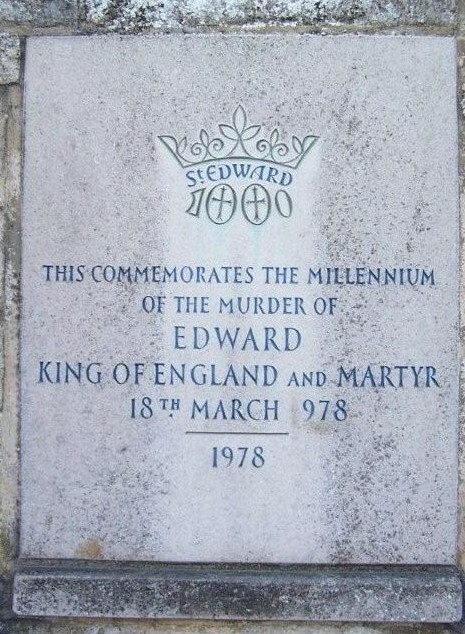 King Edward the Martyr or Eadweard II (c. 962 - March 18, 978/979) succeeded his father, Edgar the Peaceful (who set up the English shires) as King of England in 975. He was the son of Edgar's first wife Ethelfleda (d. c963/4). He had the support of the establishment and the Church and was crowned by St Dunstan, the then Archbishop of Canterbury. He was uncle to St Edward the Confessor. Even before he was crowned, he had displayed elements of sanctity and was considered popular by his people on account of his virtue. He was murdered on the orders of his stepmother, Queen Elfrida (or Aelfthryth), on 18th March 978 (or 979, there is some uncertainty about the year) at the age of about 16 or 17. The Queen lived at Corfe Castle (which is on the outskirts of Wareham, about 30 miles due south of Shaftesbury) and he called there while on a hunting party. According to ancient accounts he was offered a poisoned glass of mead at the castle gate, and while he was drinking it, still in the saddle, he was stabbed. He managed to ride off in spite of the wound but eventually fell from the horse and into a crevasse. He would have remained there undetected but a pillar of light appeared above the body, leading the search party to it. The Queen's motive was partly to ensure the crown went to her own son Ethelred ('the Unready') and partly due to the reasons that led to Edward being hailed as a 'martyr'. St Edward is hailed as a 'martyr', a designation that sometimes puzzles people used to the modern use of the word. In contemporary usage the title is usually taken to refer to someone who was killed explicitly out of hatred for the Christian religion, however, its classical use is broader. The word 'martyr' means 'witness', someone who witnesses to Christ by their death. Many of the earliest martyrs of the Church were killed for refusing to deny Christ by offering worship to pagan Roman idols. Others are designated as martyrs because they died rather than deny some truth that Christ taught. For example, in the English Reformation context we recall those who were hung, drawn and quartered for refusing to deny the truth about the Vicar of Christ (the Pope) or about the Sacraments of Christ (the Real Presence of Christ in the Mass). Others are designated as martyrs because they were killed for proclaiming the moral life Christ taught, thus St John the Baptist is called a martyr because he died proclaiming that adultery is a sin. More broadly still, there are others who are designated as martyrs because they were killed out of hatred for the goodness of their lives, their lives manifesting their union with Christ. In considering this we might note that people respond to goodness in different ways: Many people respond to good people by being edified by their goodness, inspired by it. But it is also possible to look at a good man and feel angry, spiteful, vengeful. To cover up our own sin by hating someone who does not sin. As Scripture puts it, “The wicked man plots against the virtuous and grinds his teeth at him”(Ps 37:12). To be hated and killed by the wicked on account of your goodness is one of ways of being a ‘witness’ a ‘martyr’ for Christ. (1) The people of his day recognised that he was killed by evil people who hated him for his saintly life. (2) Further, politically, they recognised that he was killed by people who hated the fact that he stood with the Church and for the Church despite the many political manoeuvrings of his day against the Church. And thus we call him, 'St Edward the Martyr'. He was buried in Wareham and miraculous cures were attributed to him by visitors to the grave but three years later, his body was moved to Shaftesbury Abbey (which was a prominent Benedictine monastery of the day and the first to be for nuns alone) by St Dunstan and the Earl of Mercia, who believed that he deserved a burial place of greater stature. (The Earl of Mercia had been one of his opponents while he had been alive). Such was St Edward’s power of healing of that at some point, parts of the body were removed and distributed among other churches. A relic of his bones from this early date is encased in the altar at St Edward's, Shaftesbury. Following the move to the new Abbey grave, the cover of the grave was observed to levitate slightly. St Edward is also said to have appeared in a dream to a devout man saying that he no longer wished to lie in his particular grave. The devout man reported his dreams to the Abbess who, in turn, reported it to the King, Ethelred the Unready. 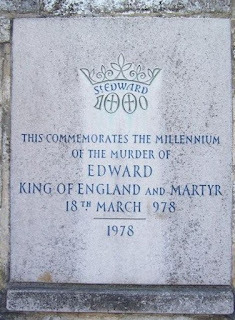 The King issued a Royal Charter in 1001 which states that "I, King Ethelred, King of the English, with humble prayer, offer the monastry ... my brother Edward, whom the Lord himself deigns to exault in our days by many signs of virtue, after his blood was shed." 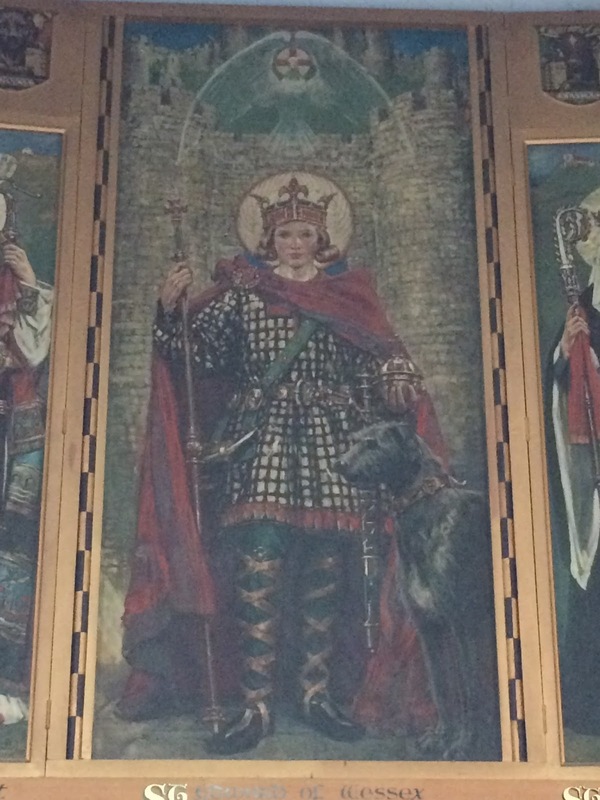 The shrine was duly built in the Abbey and he was canonised as Saint Edward the Martyr in 1008. The shrine was venerated continuously from the time of its completion until the Dissolution of the Monasteries (1536-1541) under Henry VIII when it was desecrated and demolished but the wily nuns had disinterred the body before the King's men arrived and moved it into the Church. Following the Dissolution of the Abbey, it fell into disuse and the stone used in its buildings was systematically removed to build other buildings in the surrounding area so that very little indeed remains today. In 1931 an archaeological dig at the abbey ruins found bones with markings that were said to be consistent with the injuries St Edward would have received in his martyrdom. Opinion was divided as to whether the bones were of St Edward. Given that the altar of Catholic parish church already contained relics of the saint from a more ancient source the parish priest (Fr Jeanneau) declined to have the newly unearthed bones interred in the church. The bones were eventually placed in a Russian Orthodox shrine in Brookwood. More information can be read in an article here. Here (below) is a youthful image of him, pictured in front of Corfe Castle with his hunting dog. This image is above the main altar in Swanage. Shaftesbury, Swanage, and Wareham are the three Catholic churches in Dorset dedicated to our young martyr king. And here is an image of him from Valladolid seminary, in Spain. 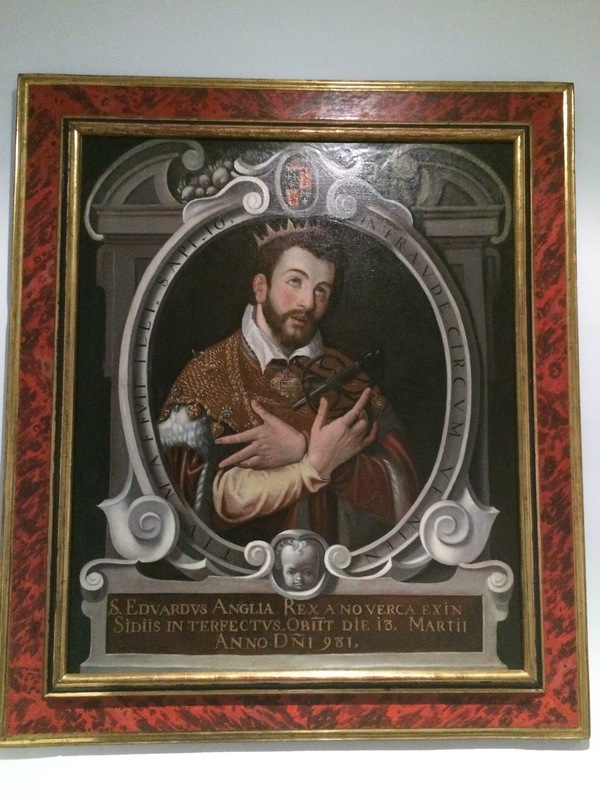 The English seminary manifests its English loyalty by paintings of a great many English kings and this one can be seen just outside the refectory. He is pictured with a full beard, something quite unlikely for a king who died at the age of 16. Nonetheless the picture shows him with a dagger through his chest, indicating the manner of his martyrdom.